For patio builders that you can rely on to create a beautiful outdoor living space that will be the envy of your neighborhood in Savannah, Georgia, look no further than Porch Outfitters. Over the course of more than a quarter century, we have helped countless homeowners turn their vision for their outdoor spaces into a reality, and we would be happy to do the same for you. Additionally, we’re much more than patio builders, and can install a wide variety of outdoor living structures. Whether you’d like a pergola to provide partial shade over your new patio, a screen enclosure to keep the bugs away, or a simple retractable awning that will allow you to enjoy your outdoor space in comfort, we have the ideal solution. And, because all of our projects are completed by trained and experienced installers – never subcontractors – you can be sure your new outdoor living space will be built according to the highest quality standards. 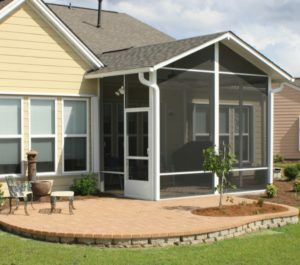 For more information about what makes Porch Outfitters the premier patio builders serving Savannah, GA, contact us today.